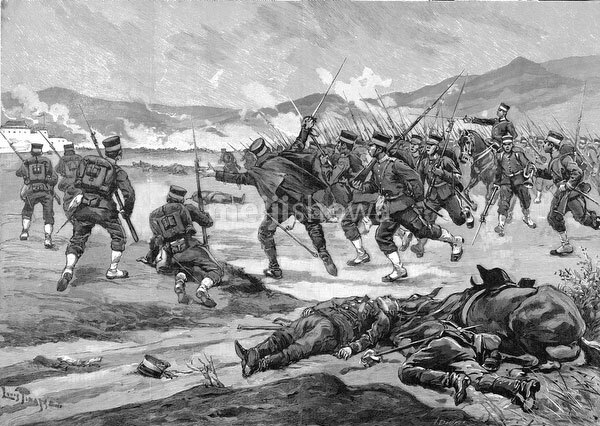 Japanese Imperial troops attack Chinese forces after crossing the Yalu River dividing Korea and China, during the First Sino-Japanese War (1894–1895). On the night of October 24, 1894, Japanese troops crossed the Yalu River undetected by erecting a pontoon bridge. Published in the French illustrated weekly Le Monde illustré on January 26, 1895 (Meiji 28). Art by French artist Louis Tinayre (1861-1942).